If you’re ready for a beach-front getaway jam-packed with natural learning opportunities and tons of local fun, look no further than this 2-day visit to Sarasota County! Located on the west coast of the Sunshine State, this 2-day adventure will let you explore some well-known local gems as well as learn about the natural setting of Sarasota and the wildlife that inhabit the area. Get ready for great food, facts, and fun in Sarasota County that is sure to impress your whole group! The Ringling - Start your trip to Sarasota County with this fun-filled attraction at the Ringling. This 66- acre campus located on Sarasota Bay was founded by circus magnate John Ringling himself with the help of his wife Mable. Combining a love of Sarasota County, Italy, and art, this complex houses everything one needs to know about the American Circus including authentic slides, wardrobe designs, posters for the “Greatest Show on Earth,” as well as photos and historic exhibits. Be sure to check out the Ca’d’Zan, or ‘house of John’, to see what the American Dream and Roaring Twenties were all about with this Venetian and Gothic style 36,000 square foot home. State of Florida’s Art Museum - A vision started over a century ago, the Florida State Art Museum was created after a period of circus travel between John and Mable during which time they collected a large number of European artwork. John put into design this 21-gallery museum to house all of the art objects he and his wife acquired along the way and it has grown into what is considered to be one of the preeminent art and culture collections in the United States. Check out the courtyard filled with Greek and Roman sculptures including a bronze cast of Michelangelo's David or head inside to witness some of the most unique and chic souvenirs of travel collected by the Ringlings. Take in the historical, social, and economic context in which all of the work was collected as you tour the Rubens Galleries or Turrell Skyspace. Pinecraft Village - Be sure your group brings their appetite when you visit this highly unique and interactive Amish Snowbird community. Home to some of the best comfort food around Sarasota (and some even say all of Florida), Pinecraft Village offers your group authentic Amish dining experiences, unique shopping, and relaxing moments playing in the parks' daily shuffleboard or horseshoe competitions. Consisting of members of the Amish and Mennonite orders who flock south to this winter haven, Pinecraft was settled in the early 1920s as an agricultural adventure to plant celery. Though the soil was not viable, the weather was, and since then this city has been a simple pleasure getaway that goes beyond the Sarasota beachfront. Don’t let anyone in your group get away without trying any of the 100 famous pies made daily at Yoder's! Florida Studio Theater - Improv, live jazz performances, or the latest off-Broadway comedy hit all await you at your last stop for the day, the Florida Studio Theater. This contemporary theater in the heart of downtown Sarasota is actually a village of four separate theaters, offering plenty of options for your group to enjoy whatever show or live music event they want to see. Providing an intimate feel in each theater, the group boasts that they are ‘small in size but large in impact’ in the entertainment and local communities. Known proudly as the 3rd largest subscription theater in the nation, Florida Studio Theater strives to provide the best contemporary theater experience for an affordable price. Let your group be the judge as you choose from the Broadway- driven Mainstage, musical Cabaret, or more experimental Stage III. Myakka River State Park - Start your group’s day out right with a stop at one of the oldest and largest state parks in the southeast, Myakka River State Park. Originally built to protect one of the state’s most diverse natural areas, Myakka continues protecting 58 square miles of river, wetlands, prairies, hammocks, and pinelands. 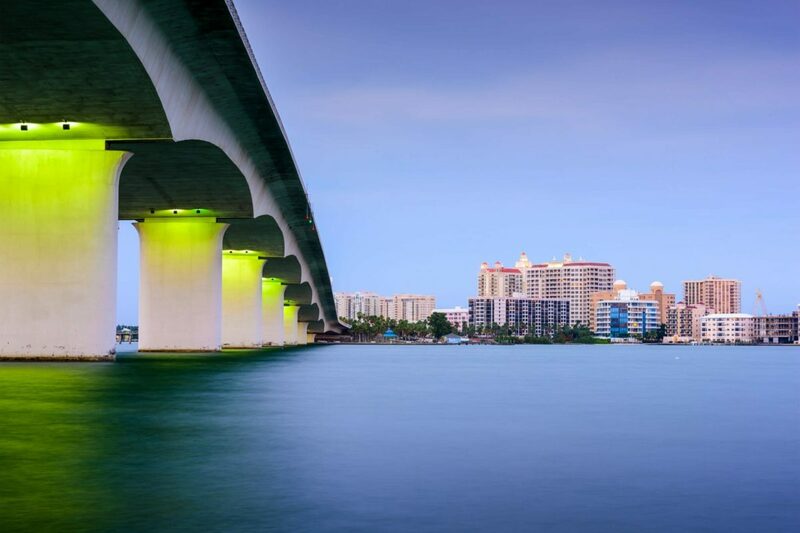 Your group will be able to enjoy the Sarasota boardwalk, take a tour of the canopy walkway, or relax on one of the two lakes with some boating, fishing, or kayaking. If you enjoy more of a thrill, you have the opportunity to take one of the world’s two largest airboats out on the water for an up-close and personal tour or even take a Safari tram tour on land. This naturally astounding area will let you see Sarasota’s wild frontier up-close and help you realize why Roosevelt’s New Deal included many jobs working in and around this state park. Marie Selby Botanical Gardens - If you haven’t had your fill of Sarasota’s natural side yet don’t worry, this next stop at Marie Selby Botanical Gardens will give you and your group everything you could desire in an outdoor learning experience. Known famously as Florida’s own “tropical and urban oasis,” Marie Selby focuses on epiphyte study and growth, and with its five buildings dedicated to education, you will definitely get the chance to personally learn about epiphytes (or what that word even means!). Growing in tree canopies, epiphytes like orchids, ferns, and bromeliads attract 130,000 guests annually to this 15 acre garden. Started in 1973 when many plant scientists ventured into the world's wildest locations to study these plants, this impressive establishment now holds several features with something for everyone in your group including the koi pond, rainforest garden, banyan groves, and bamboo garden. Don’t forget your camera! Mote Aquarium - Three viewable-working labs, two fully operating touch tanks, and one impressive 135,000-gallon shark habitat will all greet you at your next stop, the Mote Aquarium. This world-class aquarium began with a goal of studying the life of sharks but has evolved into an educational resource tackling such subjects as human cancer studies in marine life. At this stop, you will experience the dynamics of the environment and life of manatees, dolphins, sea turtles, sharks, and coral reefs. Conservation and restoration is the focus here, so be sure to say hello to some of their biggest success stories such as Buffett the manatee or Shelley the sea turtle. Relax for dinner at the Mancini Diner’s lively cafe setting as you watch the marine life in tanks around you!